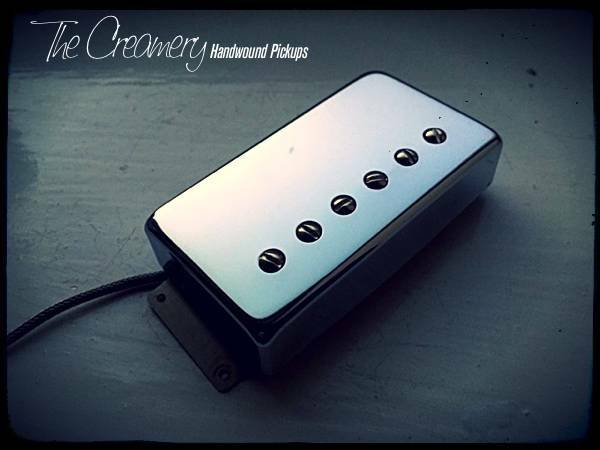 A lower output than the Creamery '59 with custom offset windings and custom sized, strong Alnico 5 or Ceramic magnets. Partly based on the '70s Gibson T-Top humbuckers and the bright, aggressive punk sounds of the era, its a real brighter, more focussed, punkier humbucker sound for those looking for that brighter, muscular attack and crunch that cuts through the mix a little more. As with all my humbucker pickups, the coils are asymmetrically wound giving more dynamics, clarity & string definition. A richer sound. Available in chrome, nickel or matte/aged larger Fender Wide Range size covers.